Another Breakthrough encounter as Colin's Ithilien troops attempt to get through Tel's forces of Mordor. Given the ratio of points was heavly in favour of the hordes of Mordor a breakthrough was always a big ask. The Ithiliens went for a high risk strategy of charging their knights along with all their leaders straight ahead and hope that the fragile morale of the Orc warbands caused a rout. Unfortunately (for the Gondorians) a sliding door maneuver lead to the cavalry's intended targets being replaced by a row of four Olog-Hai (Trolls) and the fear inducing Mouth of Sauron and his command team. All or nothing for both sides! The crash didn't go well for the Knights despite being armed with throwing spears and getting a re-roll of all initial fails. Armour played a vital role as the Trolls made a number of 5+ saves. At the end of the combat it was 3 knights lost verses 1 scratched Troll, and the horses bounce back as the Trolls pursue behind ready to charge in their next turn. The Trolls charge into the cavalry's rear and pushes\routs them through their own shieldwall which then receives the charge proper. Due to the fear effect the infantry are forced to make a morale check to receive and fail. Since they have no re-rolls due to all the leaders\standards being with the routing troops they rout but not fast enough and are then pursued and destroyed. This forces morale checks on nearby troops which causes a domino effect along the Gondorian line. Only the archers on his flank remained unaffected. This is in fact near the end position after round 2, when Colin announced that he'll be withdrawing his one unbroken unit next turn, and I agreed that I was in no real position to chase and catch any of his other units. My attempt at trying to flank his forces with the Warg Riders and some quick marching Uruks never had the chance to come to fruition. The other battle of the night came to an almost as abrupt end when the Elves luck\arrows finally ran out and they were caught and thrashed by the forces of Saruman. By turn 3 it was all over, and the absent fairy queen will probably be furious when news reaches her\him. 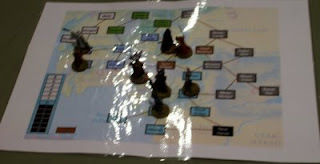 Given that the final battle was in the middle of nowhere we ended by doing the map moves for round 5. The elves are now up against the wall at Helms Deep, while the army of Gondor is now being pursued by the forces of Sauron to Osiligath from Minas Tirith. The Haradrim have a slight problem as their Oliphant appears to have got bogged down in rough terrain, but at least it will give them time to recover.